The North Fork Goodnews at Absolute Peak of Season. We’d had rain showers overnight, which cleared to a lovely afternoon. Flying outbound through alpine mountain passes we saw hundreds of small waterfalls dropping like pearl necklaces down the peaks. We were a group of experienced anglers, many had travelled with us on prior trips and all were keen outdoors people. Glenn Libby and I flew together and watched a large solitary Grizzly / Brown Bear high on a mountainside grazing blueberries. 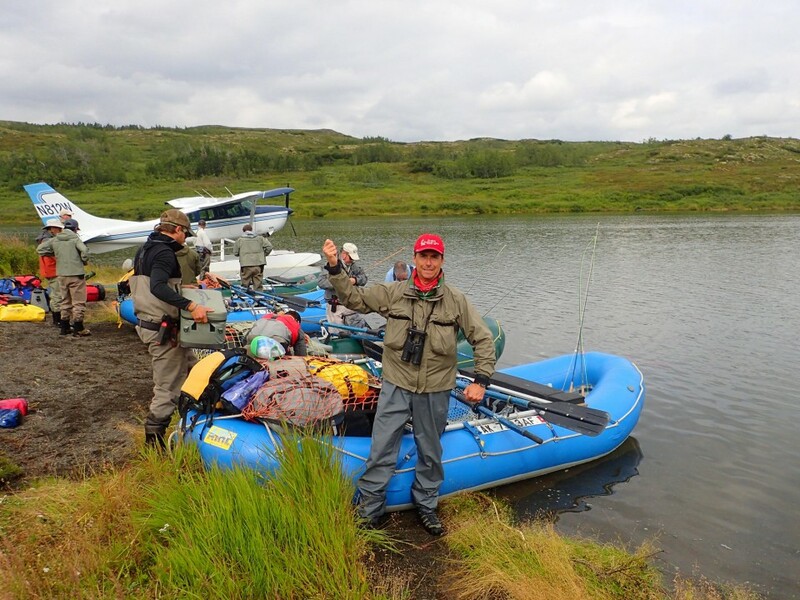 We all helped unload floatplanes, pump up rafts, and rig fly rods eager for the river adventure to begin. The sky filled in with cumulous clouds and we pushed off downstream making camp a couple of hours later on a broad gravel bar where a few late wildflowers still bloomed. We passed hundreds of King and Sockeye salmon staged near spawning gravel and a great many Chum Salmon spawning. Also, one could not help but look in astonishment at the tonnage of dead salmon carcasses strewn on gravel bars and carpeting the bottom of the river in sloughs and eddies. A bit of misting rain did not dispel our high spirits. 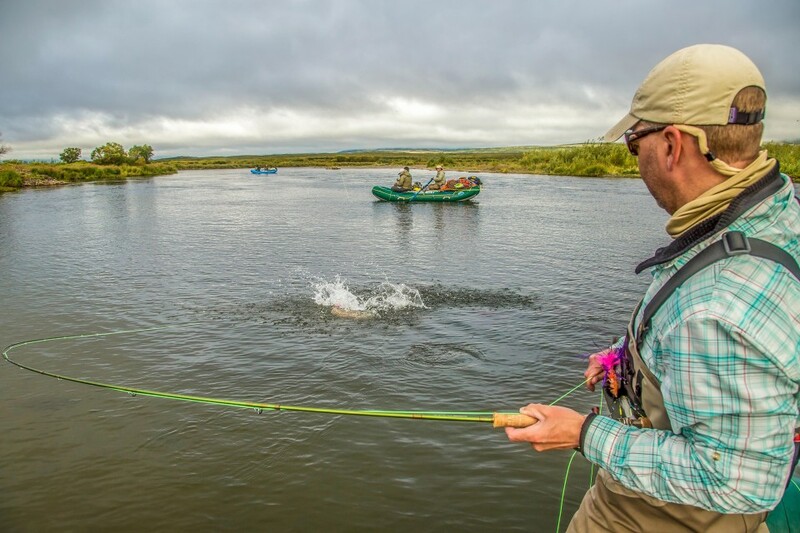 While our pasta dinner cooked the sounds of large fish porpoising on the ends of fly lines while friends netted for each other was heard up and down river. A half dozen Kings were released as well as the first Coho of the trip and very strong numbers of Dolly Varden Char and Rainbow trout. On our first full day on the river I fished and travelled with Mike Diciano and Feike Posthma and we caught up with one another’s family stories while casting & rowing. The weather was blustery, spitting rain and gusty with all the hallmarks of a cold front passage. 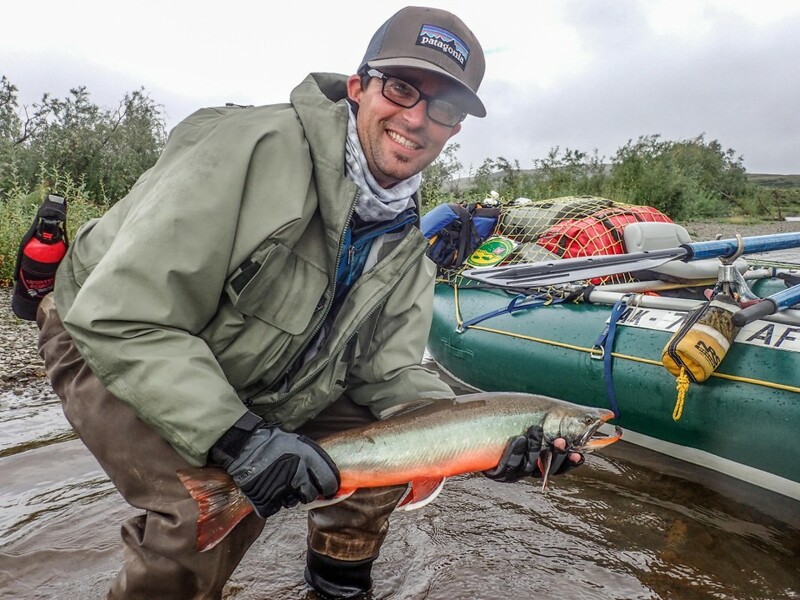 The log recorded several hundred Dolly Varden, some nice Rainbows, and one dozen Coho released in a nearly continuous round of casting, hooking, and netting as the group passed down through the alpine canyon. The weather was dramatic changing from sun breaks to intense rain and wind every so often. Fishing past the first prominent bluff on river left we lingered while catching and releasing Dolly Varden all painted with orange, pink, and green spawning colors. 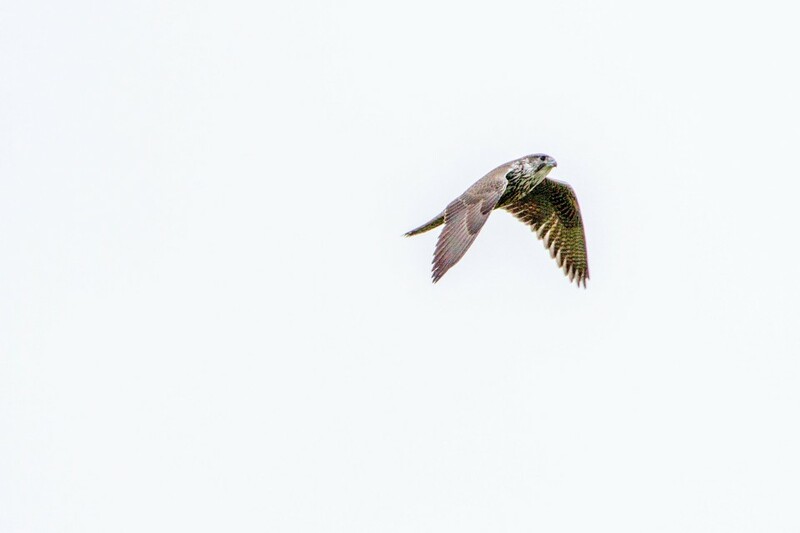 As we departed the pool a Gyrfalcon passed close overhead allowing Pete Jaacks to photograph it while the rest of us watched it’s dramatic aerial performance. We see a handful of “Gyrs” each season and each is a treasured memory but this was the best sighting in many years. The light was good and the gusty wind stimulated the bird to soar and stoop over the rafts and bluff dramatically. We made a good weather tight camp beginning with the wing behind a windbreak and then with 2 rafts rigged as tent windbreaks and then settled in for a glass of Pinot Noir. We were protected from the wind for the evening. Dinner was Sockeye salmon and it felt good to relax. More fish were taken near camp and many anglers turned in to sleep early. Cranes chortling, and Common Loons calling as we had coffee. The Cranes were feeding on Blueberries in the tundra. Some of the streamside Willows are turning golden as autumn days are colder and shorter now. We watched 2 young Brown Bears with binoculars across the river and up a small bluff from camp as we finished breakfast. The river water level was high from last week’s rain but clear, dropping, and fishing very well. I fished with John Lowden and David Hill, friends for several decades and they enjoyed the fishing and the wildlife. A pair of Tundra Swans passed overhead and the journal notes we’ve seen more Merlins (small falcon) this trip than all summer combined. We are experiencing the autumn bird migration and loving the spectacle as family groups of White Fronted Geese and large migrant flocks of Cackling Canada’s pass overhead. 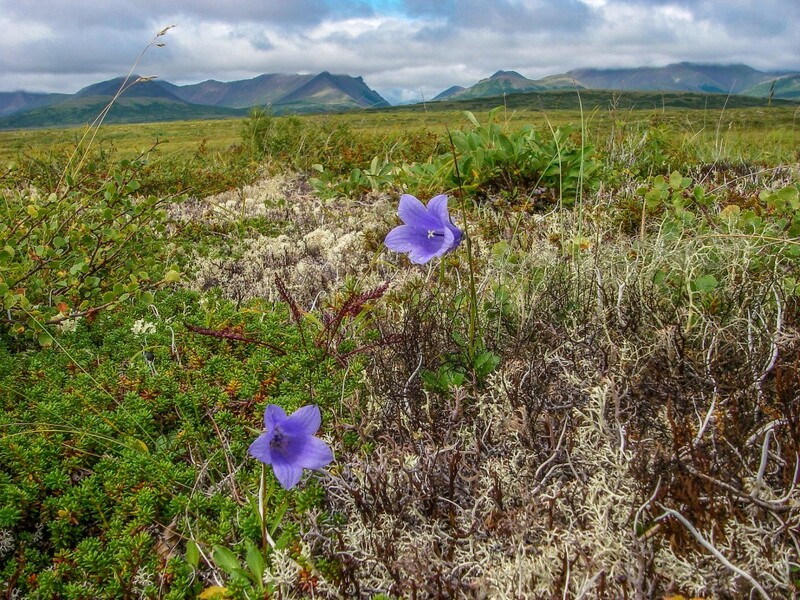 We hiked across the tundra atop a bluff and watched a large Brown Bear grazing on a hillside. 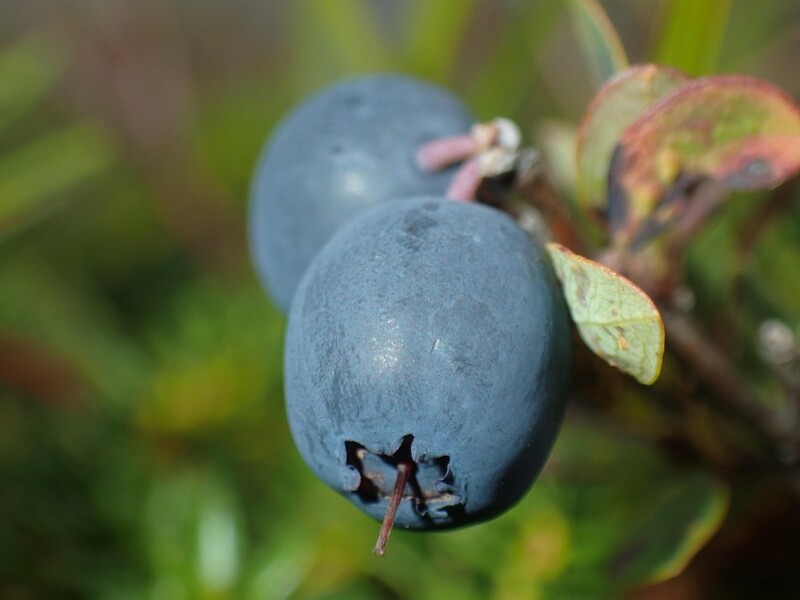 We did quite a bit of grazing of the blueberries, crowberries, and Lingonberries ourselves and reveled in the afternoon sun. 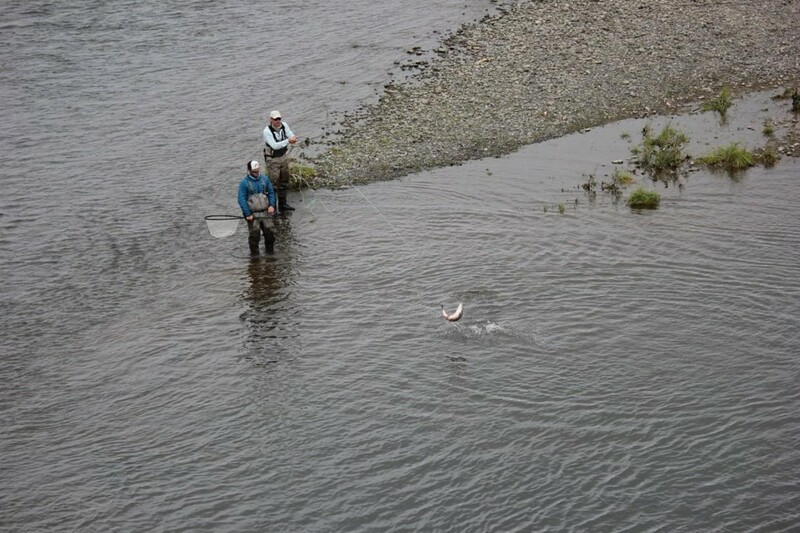 The Coho fishing was heating up by the hour and the anglers released 19 this afternoon. 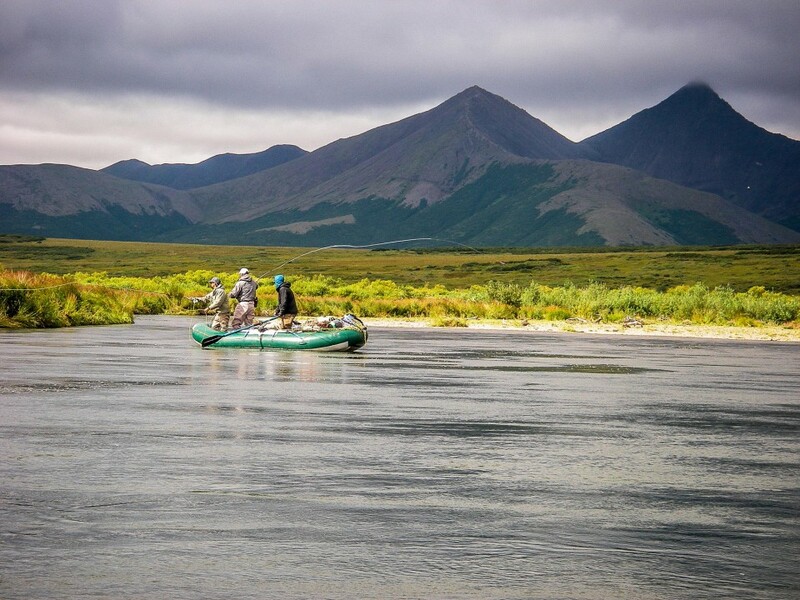 As we pass downriver we fish for trout and Char with our light rods and then pick up the heavy streamer rod. 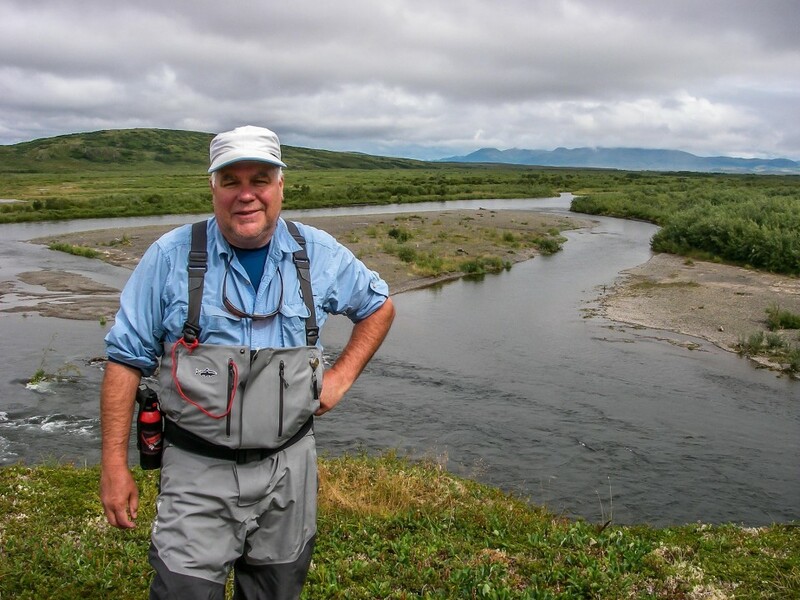 The key to the upper Goodnews salmon fishery is to recognize the water ahead as either trout/char water or salmon water and be prepared as the oarsman gets the boat positioned for what might be only one cast into a bit of Coho holding water. 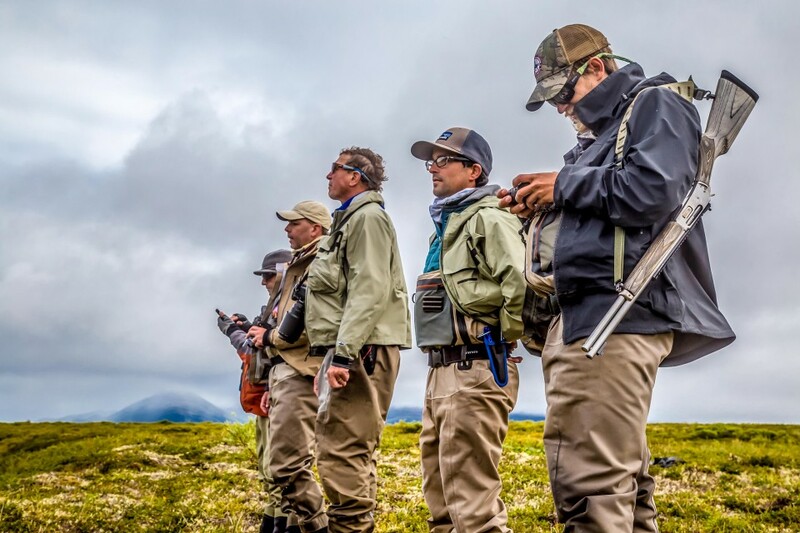 When we can, we will row back upriver for another drift past the more productive slots but the angler who is prepared and ready to fire the cast into the money hole is rewarded. Hours and days blended together. The rain and winds came and went but the fishing was rock solid and improving by the mile. It was a particular joy to watch Father/ Son “Team Diciano”. 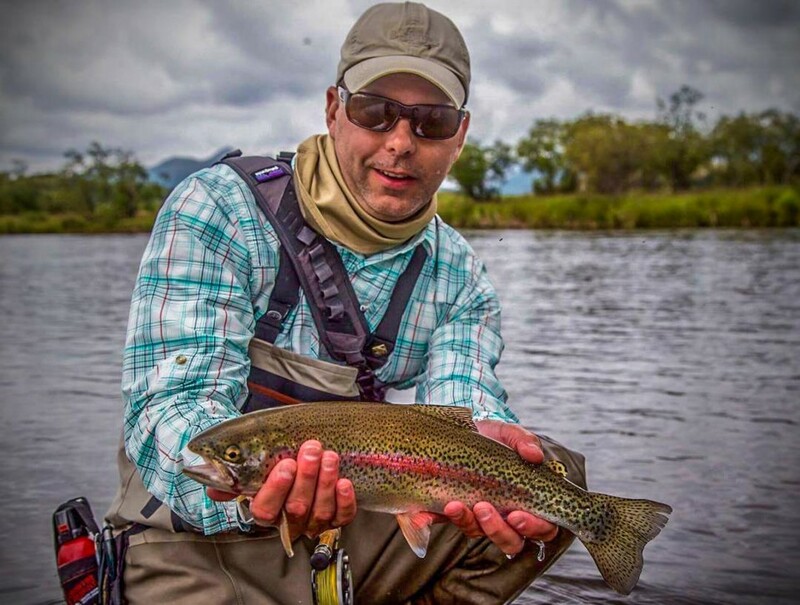 Aaron had lots of passion and an athletic cast and accomplished a lot each day getting angling mileage with increasingly large and powerful fish. The dad, Mike was usually first on the water and last off the water. They may long remember this trip together. Some much appreciated drying weather yesterday evening. 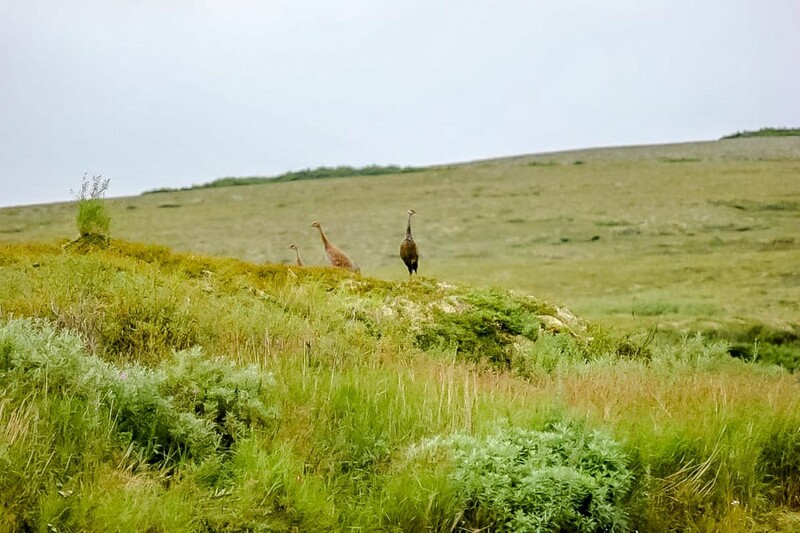 Waders and other layers were spread out on driftwood and draped over tents” Later in the evening Feike, Aaron, David, & John hiked to a bluff across from camp from which vantage they watched a sow Brown Bear with 2 yearling cubs grazing in the Canyon Creek hills. Pete Speer reported that the moon was near full. There is considerable magic along this great salmon river if one looks for it! Morning fog, which gradually burned off yielding a perfect afternoon and evening. The river water level dropped again over night. 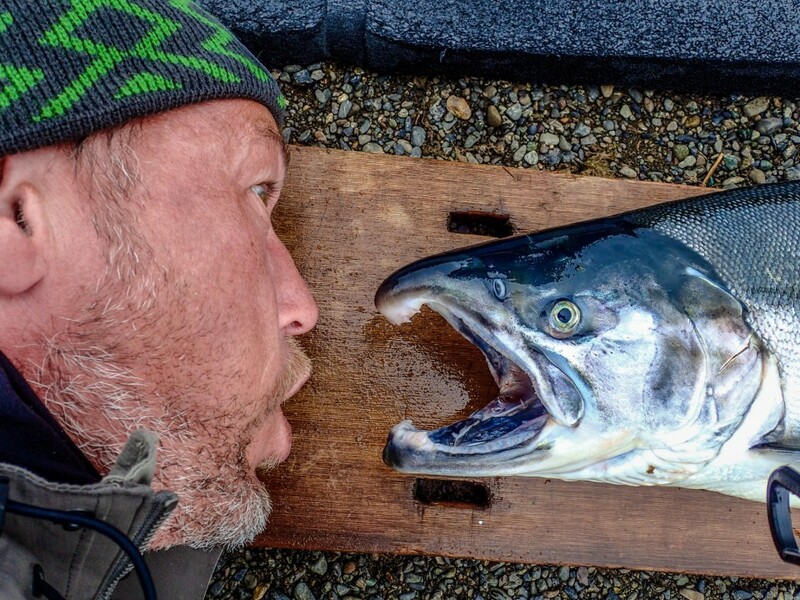 The cold front of 2 days ago is long past.” The conditions are now perfect for Coho. 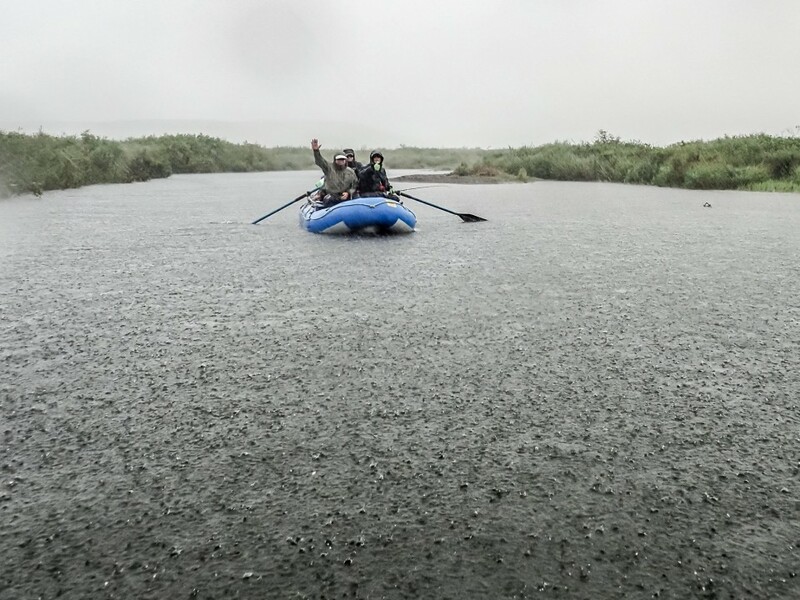 The salmon received that good slug of rain to encourage them to push up from the Kuskokwim Bay, entering into the river last week by the thousands. In the pastel early morning light squadrons of Gulls patrol the river, and a Raven croaked. A Tree Sparrow, (the last of the migratory passerines competing for breeding territory) trilled its mating song, the land is otherwise mostly quiet. 4 Large shorebirds, perhaps Willets, flew past camp. The fishing has intensified by the hour and anglers are experimenting with all kinds of patterns. 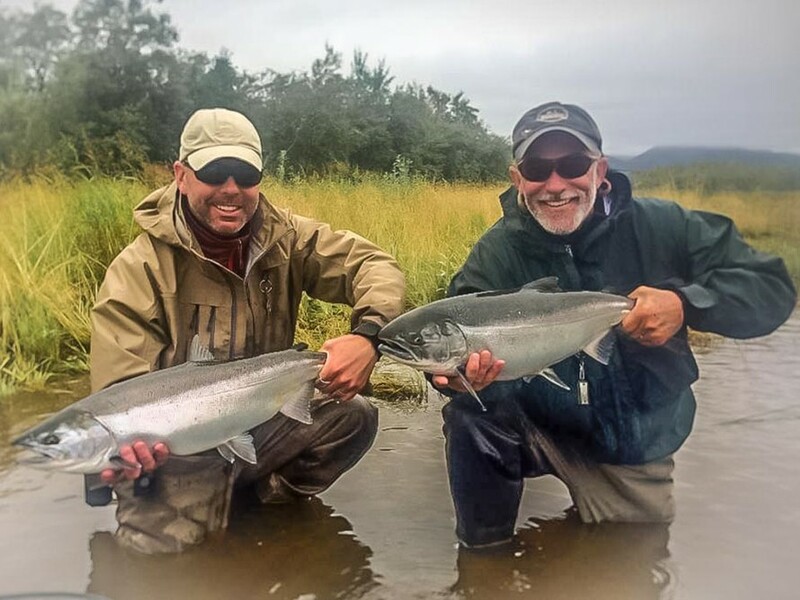 John Lowden & Pete Speer raising Coho on a surface fly pattern ordinarily fished for Char, the “Orange Gurgler”. In one large pool the group took 30 Coho on streamers over a period of less than an hour. Wolf tracks in the sand at lunch. A solitary smaller Wolf made them. Perhaps a female. Also at lunch a Northern Shrike rose up from a willow thicket and attacked a falcon, which was passing by. 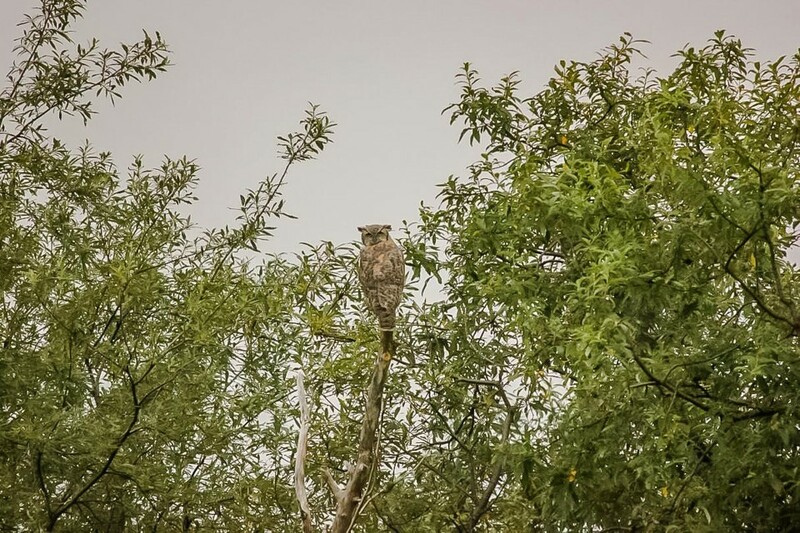 Across from the Canyon Creek bluff we saw a family of Great Horned Owls. We’ve seen them raise young here for many years. It would be interesting to know whether they are primarily feeding on Voles and Lemmings or perhaps on night roosting birds. The many juvenile Yellowlegs, (large sandpipers) which sleep in the open on gravel bars might be vulnerable to an Owl. John Lowden and Pete Speer and I parked the raft in a side channel and climbed a bluff that Pete remembered for it’s historic blueberry abundance/ We spoke of picking berries right here in years past and of the many camps we’ve shared together on the Nushagak, Kanektok, Middle Fork, and other rivers. 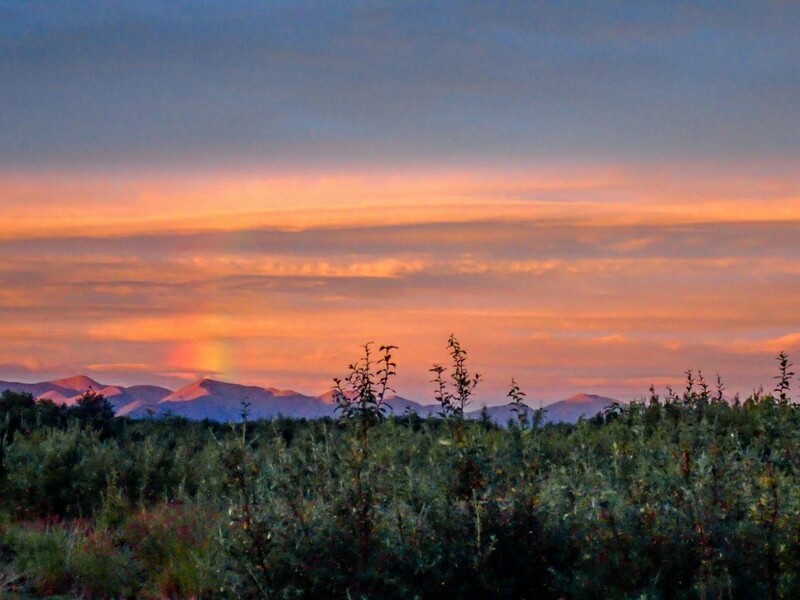 We walked together and we walked separately each in our own private world of landscape and sun and personal memories and we ate berries like the brown bears and the Sand hill Cranes while gazing across an immense land. And then the rest of our party of anglers arrived below us intent on the fishing. 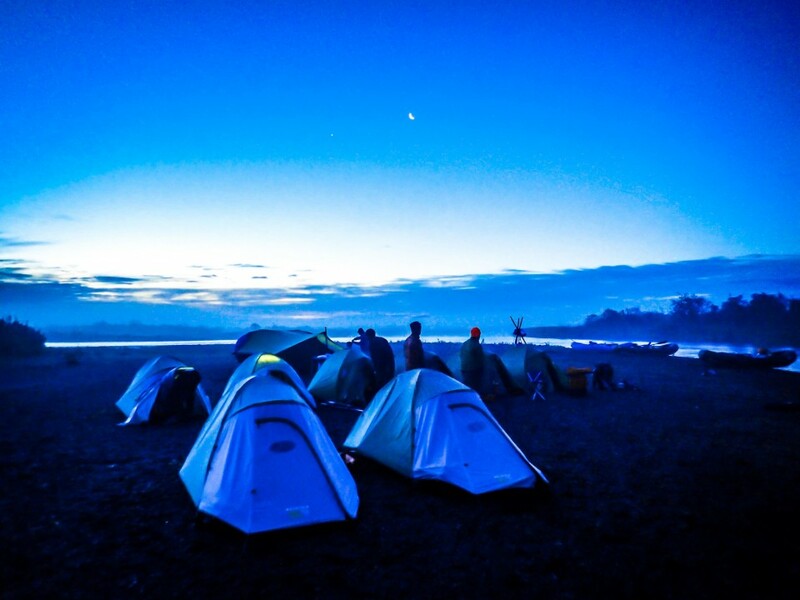 This night’s camp is called “Wolf Camp” and it didn’t disappoint. We found Wolf tracks in the soft sands and mud along the back slough. It’s a big bar with a dependable breeze keeping the insects away, a long rocky bluff on the right and mountain views in 360 degrees. We ate Pasta and Pesto, Salmon, Pine nuts, and a salad. We enjoyed the camaraderie and the lovely evening weather. 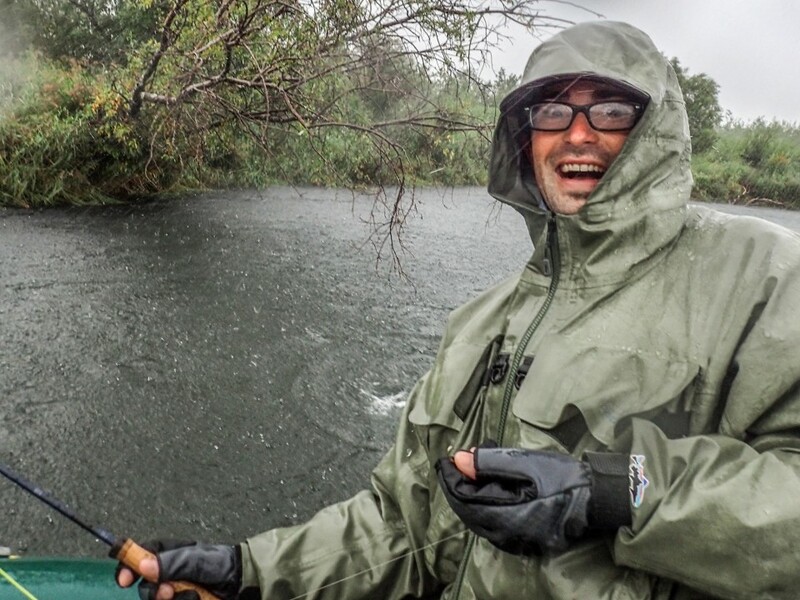 After dinner fly fishing excursions were launched and considerable hilarity ensued in the correct proportions. It was said the following morning by several witnesses that the 3 young guides took a holiday recess late in the evening. They launched a raft, and took 20 Coho, rods doubled in 10 passes through the pool. I slept soundly however and can only report what I was told of those shenanigans. Shortly after sunrise while I made coffee and wrote field notes Mike Diciano was casting a Pink Polly Wog in the slough and John Lowden was taking his morning swim in the river channel. 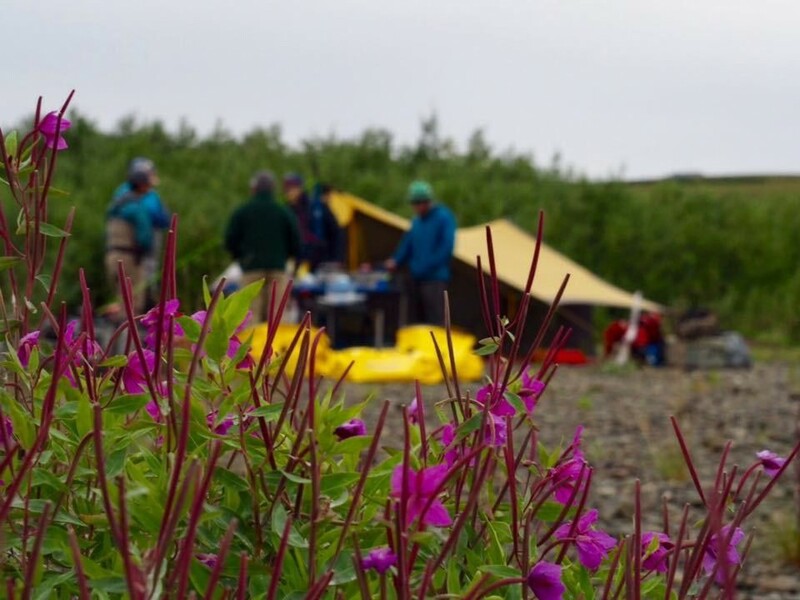 The quiet camp was set on a gravel flat with a few fading wildflowers like River Beauty and Yarrow, and one single purple Lupine”. Then Mike’s first salmon of the morning rocketed skyward and splashed back breaking the mirror surface of the pool into a million diamonds. We breakfasted, packed and prepared the rafts. A lone male Pintail duck flew over camp as we loaded boats and set out for the day. The boat pairings on day 5 were Brian Malchoff with John Lowden and David Hill, Mark with Aaron & Brian Reed, John Jinishian with Feike & Libby, and Pete Jaacks with Mike and Pete Speer. As we fished and passed the time we watched a cow Moose angle down a tundra ridge to the river. That she had no calf was noted but not surprising. It’s tough to raise a calf in this harsh sub arctic land characterized by summer rainstorms and winter gales set amid the territory of Brown Bears and Wolves. I have no judgment on this except to say I favor a natural balance of predators and prey. We are now deep in the middle of the Goodnews Wolf pack territory and they have 6 pups to feed this summer. 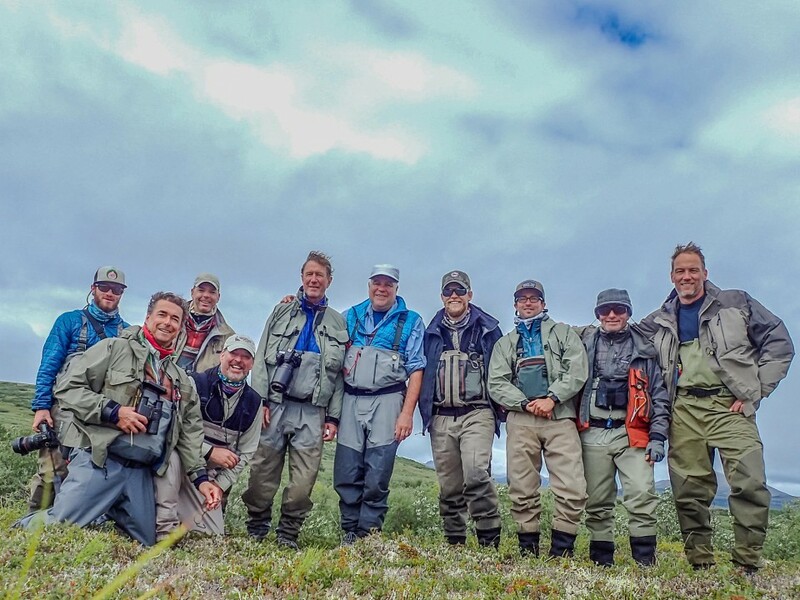 I glance at the tally of the fish in the log but I won’t reveal the final number because if you hadn’t been with this group of intense anglers, or fished with us before, the tally seems improbably high. 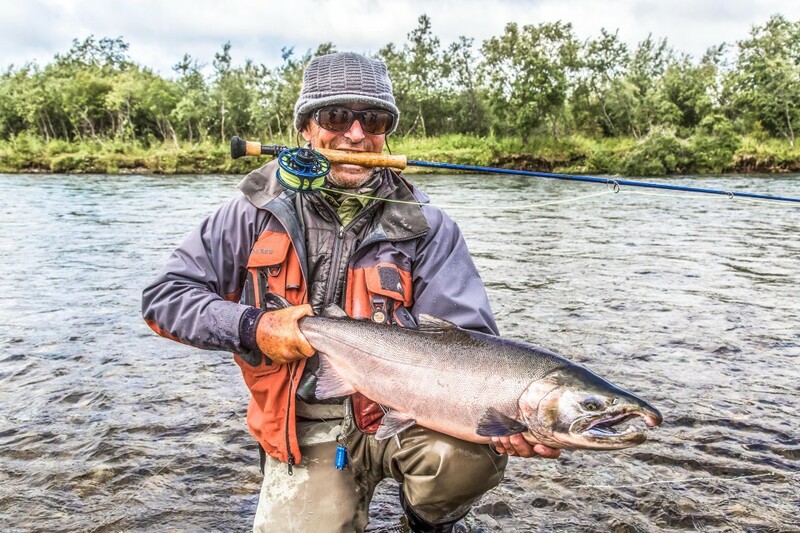 I will say only that each angler was very focused and worked hard all day, earning their dopamine grins and that the “century mark” in the Silver Salmon release tally was passed in the afternoon. Thanks to Brian Reed the chef had a perfect large male Coho to work with for dinner! 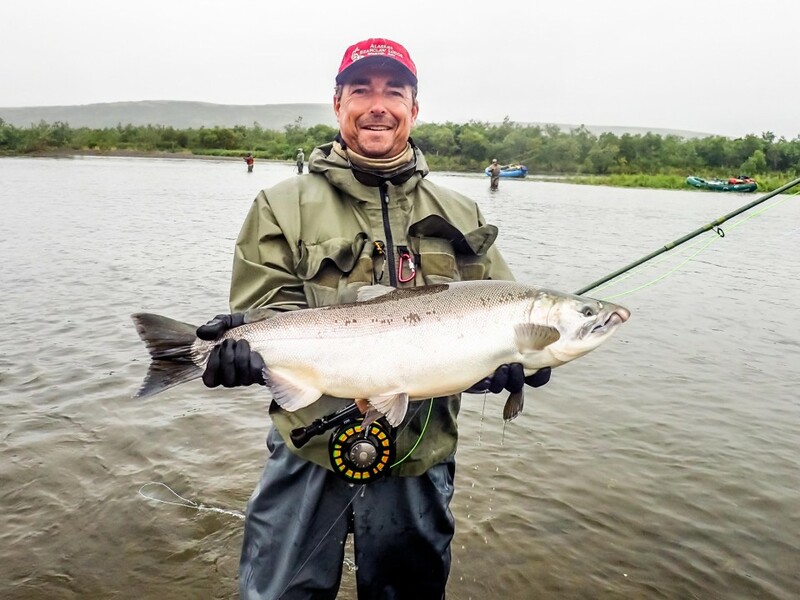 John Lowden set the hook in a powerful salmon that ultimately broke the leader. Nothing unusual until it began to leap free of the water with the large pink streamer in the jaw, as if showing off a new piercing. Hopefully potential mates were impressed. As we rafted, watching the land scroll by, a flock of 130 Greater White Fronted Geese lifted of the tundra where they had been grazing on blueberries and passed over the rafts, headed downriver. When waterfowl passed by I looked at Glenn Libby and he looked back knowingly. We were both thrilled at the sight of wild wings at dawn & dusk. Hour after hour we shared the thrill of this wild river with its fish and it’s wildlife. We passed the quiet water of sloughs and watched salmon fingerlings leaping free of the water to catch midges a few inches above the surface. Such enthusiasm! Red Throated Loons croaked as they flew up and down the river corridor. In the late afternoon and through the evening the coastal fog settled upon each mountain in the valley until they were all cloaked in mist. We were now less than 20 miles from the Kuskokwim Bay of the Bering Sea and the marine influence was a factor. 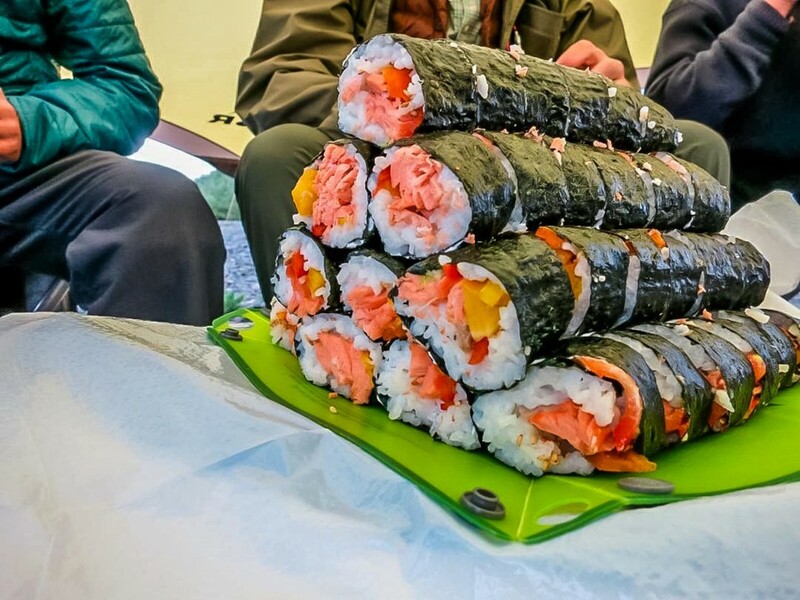 In a slough above camp we cast to pods of salmon and sometimes the 4 rafts were all doubled up. Aaron turned around and said: “This is the fifth best day of fishing in my life- in a row!” I think he spoke for many of us. We had Dolly Varden steaks for an appetizer that evening. 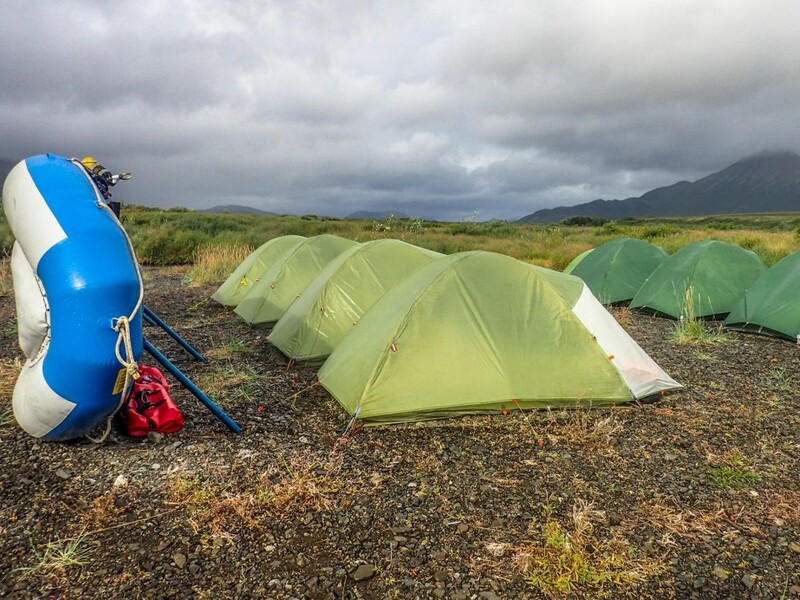 On the sixth day we awoke to rain and wind and it took a bit more time to break camp, keeping the tents dry. We set off in the wind and moisture and the fishing was challenging. Brian’s boat passed beneath an Eagle nest on a small right channel that he was exploring just when one adult made a food pass to the 2 eaglets of a 12” Char. In my boat we fished a traditional Blue & Black Kilowatt which took Rainbows fairly steadily as did a Black and Pink Megawatt. We stopped for lunch on an unremarkable island; rough cobble with just a few flooded willows and lots of salmon carcasses. Unremarkable except that it holds Coho downstream at the corner. We call it “Jim’s Island” after our friend Jim Bean. 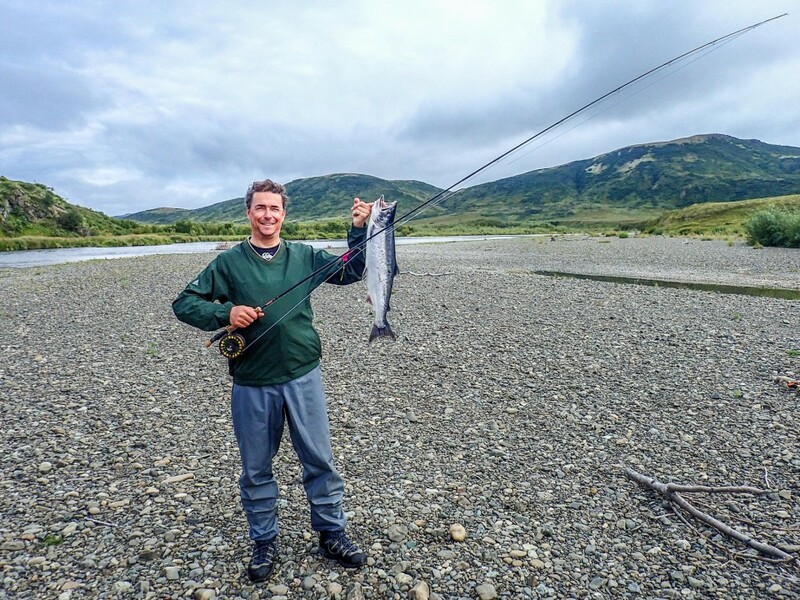 The guides and guests pestered me to fish and so Feike handed me his fly rod and I cast into what we call the golden triangle where at the very bottom of a slough the current collides with the opposite bank and Feike graciously netted several Coho for me. It’d been 2 years since I’d felt the jolt of a Coho and I’d forgotten their power. After releasing the first fish when I recast I felt mentally transported and no longer in the frame of mind I think of as reality. I wanted more. Then I caught more and then I wanted lot’s more. I’m not sure whether I wanted more fish or just a cocktail of Dopamine and adrenaline in my vein. For me there are certain fish that alter reality and actually transport me to another state of mind, almost like a drug. Tarpon certainly transport me when I’m fishing in the salt while in fresh water it’s very large Rainbows, Steelhead, and these amazing Silver / Coho Salmon. We passed downstream casting to each tiny “Seam” below an island or gravel bar. We cast into every back bay. And most held fish. The Kilowatt with a split shot a foot above it was the fly of choice for Feike. For John it was the black and pink Megawatt. We cast and the mountain peaks drifted past with cloud formations shifting. We saw 3 Young Ravens clowning around attempting to land near one another and attempting to perch, and mostly failing to land on ill suited willow branches. We camped on a large gravel bar and the river itself now felt large. It had accumulated tributaries, day after day and now was spread out. The number of carcasses which needed to be shoveled off the bar for “sanitary” odor control was staggering A very dark chocolate colored Brown Bear grazed on a tundra slope in the late evening. Our final day of fishing and travel. Sunrise was Pink and Cerise and Orange. The barometer was rising at 30.35mb. Red Throated Loons cackled & Gulls lamented, with Sand-hill Cranes yodeling their relic Pleistocene cries. I spent a day of drizzle and laughter with Mike and Aaron Diciano. Many, many dozens of Coho released by each angler while the flocks of migrating geese and Sand-hill Cranes passed by. 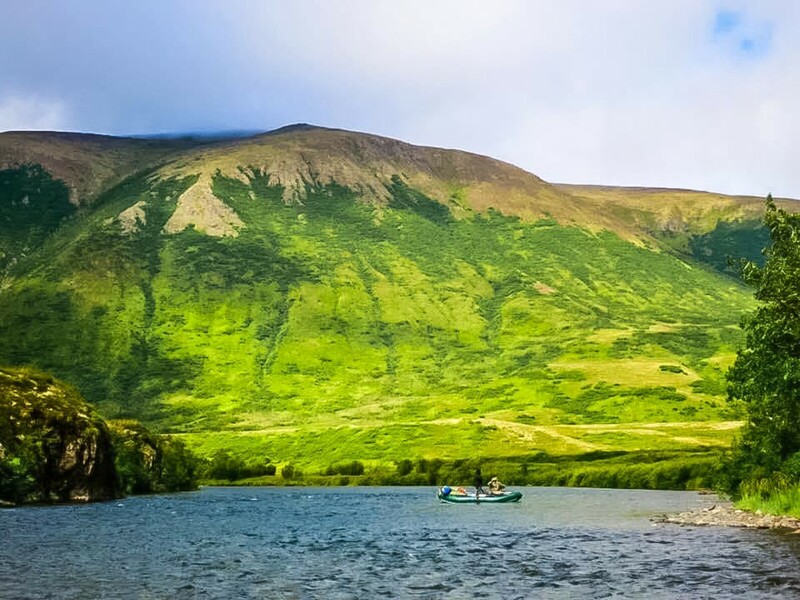 Late in the day we took a raft group of unprepared anglers outfitted from the same unreliable outfitter in Bethel, whose groups we rescue every year “under our wing.” It would be too strong to use the term “rescue”. Still, they were clearly lost and asked our assistance. 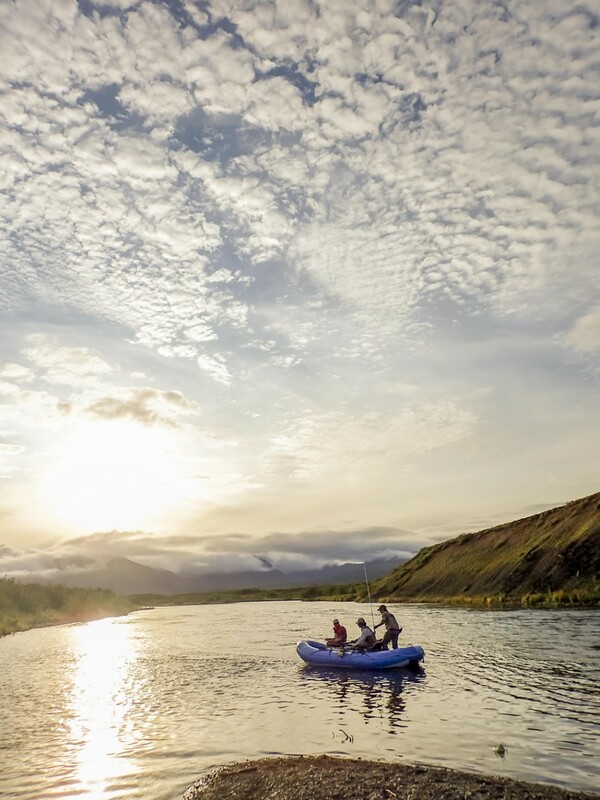 Unfamiliar with Alaska and this region in which they travelled, and not having brought paper maps, while relying on a rented GPS which was dropped in the water days earlier and an iphone with no cell service. One helps other travelers because the alternative is dire. Aaron Diciano spoke for many of us at the end of the river when we rolled up the rafts and boarded floatplanes home. 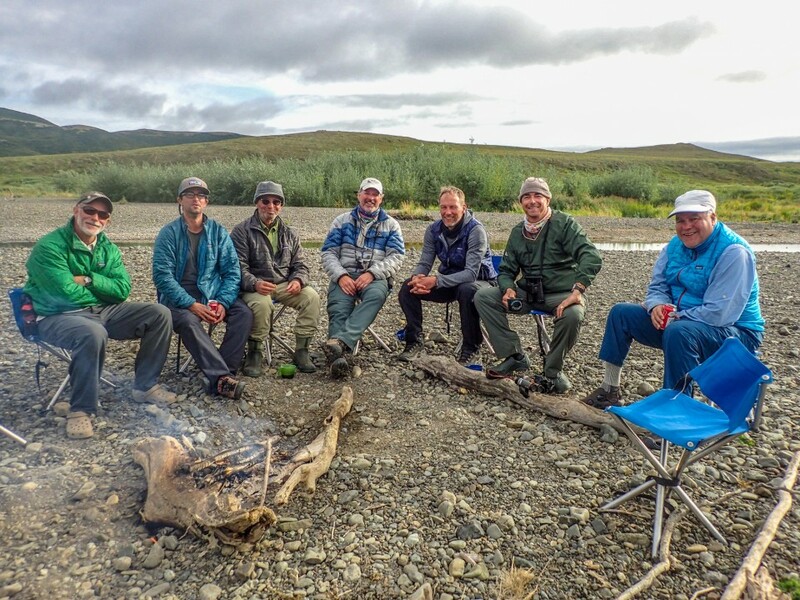 He edited his comment from day 5 saying: “For 7 days, I had the best day of fly fishing of my life.” Thank you Glenn Libby, Brian Reed, and David Hill for joining us this year on this great Alaska trip. You each brought lots of passion for the outdoors. Likewise Aaron Diciano thanks for coming north and fishing with your father, Michael Diciano. Pete Speer your voice still rings out around the river bend whenever you hook up Good Golly miss Dolly! John & Feike, such a pleasure to travel with you across this landscape. I loved it when you spoke your childhood common language, Dutch in the quiet of the evening and morning as you assembled your gear for a day of travel. Of course no one but John Lowden got up each morning and bathed in the river rain or shine!